I recall my dear friend Rabbi Mordechai Ganzweig, may the memory of the righteous be a blessing. I was a young man when we had this conversation. He warned me about the problems associated with teaching, of being a teacher, the dangers, the economic hardships, the lack of recognition and appreciation. I was a young man, just starting out in life, still in Yeshiva (Yeshivat Chafetz Chaim, named for Rabbi Yisrael Meir Kagan of Radun, Poland). Rabbi Ganzweig was a “Polish Hasid”, and wore his spodik, a tall fur hat worn by some Hasidic Jews, in particular those originating in Congress Poland. (the part of the Kingdom of Poland connected with Russia). He certainly looked out of place in Los Angeles, in fact when he took his kids to Disney land other children thought he was one of the attractions and wanted to pose with him. The kind hearted rabbi agreed. With his long black coat, long beard and fur hat he indeed looked like a character from another world. And he was. He was from a world devoted to study, to teaching, to holiness. These are not exactly highly valued qualities in California. He told me that if you were born to be a teacher then there is no other choice. If the smell of stencil and chalk and the mimeograph machine excite you – you are a teacher. Some of us were born to teach. When I first started teaching, so many years ago, there was a young girl in the class, one of only very few females. She was full of life but also full of pain. I could not figure out her pain but she was always looking for a conflict. It was not easy. Sometimes I had to run out of class chasing her, calming her down and convincing her to come back. Other times she sat on my lap until she calmed down, until the inner storms subsided. I adored the little girl and did what I could to make her feel important. She thrived and excelled. At her bat mitzvah she did something unusual. Unlike the other little girls who delivered corny little speeches that all ignored she decided to put on a martial arts show. In the synagogue, in front of all her guests, in front of the rabbi. And she asked me to join her. We put on quite a show to the music of Alanis Morisette. That was all so long ago. This past Saturday I was walking over to my cousins for the Sabbath meal when I heard a female voice call out “Moshe”. At first I did not respond and I kept on walking. After all there are so many people named Moshe that unless I recognize the voice I do not bother answering. Of course, it was her, the young girl from years ago. She is married now, a mother of five. She is an actress and has an on-going show, about what I do not know, but I am told that my name figures prominently and there are martial arts parts. So, she stopped to tell me that huge impact I had on her life. She told me how our class was the only place where she could be herself and where she felt valued and important and successful. And now that her kids are experiencing some of the same challenges she did, she relives that childhood experience. Wow, the impact of a true teacher. Now this lesson will not benefit most Krav Maga instructors, for they belong to businesses, not to teaching organizations. Their goals are about market shares and quarterly profits, not about giving kids self confidence and respect. So they do not need this blog. But for those of us who are teachers it is all about the teaching. It is all about the kids, of all ages. It is about the impact we are having on peoples’ lives, even if we only find out about it 20 years down the line, or never. A little over a year, I was delighted to receive a letter from Rabbi Ganzweig’s son, who was very happy to learn a little about his father. My cup overflow with the knowledge that I was able to provide some lesson from his late father. May the memory of the righteous be a blessing to us all. 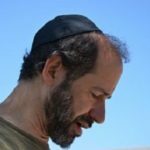 Moshe Katz was born in Cleveland, Ohio, and has lived in Maaleh Adumim, Israel, for many years. He is a graduate of UCLA (BA) and Bernard Baruch Business School (MBA). He served in the Israel Defense Forces (IDF) – Infantry. Katz has over thirty years martial arts experience. 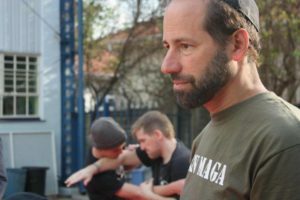 He is the founder of Israeli Krav International (IKI) and serves as Head Instructor. His current rank in Krav Maga is sixth dan black belt with the title of "Master". He has authored several books including: Israel, A Nation of Warriors (available on Amazon).